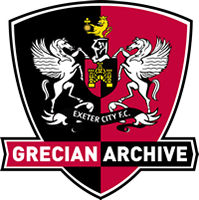 A guest player for Exeter City during the 1945-46 season, Gadsby played 8 games in the Division Three South Cup (Southern Section), the first of which was in a goalless draw at home to Brighton and Hove Albion in February 1946. He was signed by Leeds United from Middlecliffe Rovers in October 1934. He also played for Scarborough. He waited three years for what turned out to be a nightmare debut, in a 1-7 debacle at Goodison Park against a rampant Everton on 3rd March 1937. However, when a regular first-team chance came at the start of the 1938-39 season, he took it confidently, missing only five games in the season. He toured South Africa with the F.A. in 1939. When the Second World War started he was able to play fairly regularly for Leeds. He was there at Left Back in the first game in the Wartime League on 28th October 1939 in the 3-0 home win over Bradford City and he went on to miss only three games in the Regional League North-Eastern Division in the 1939-40 season and played all four War Cup games. The following season in the 1940-41 season North Regional League he missed just seven games and also played twice in the War Cup. After that his appearances were vastly reduced as he saw service in the RASC, but he did get a rare goal on 1st April 1944 in a 3-1 win at Chesterfield. He scored one goal in seventy-eight Wartime League appearances and played six games in the Wartime Cup. He also guested for Sheffield United in the 1943 League (North) Cup Final and played one other game in the 1944-45 season for them. 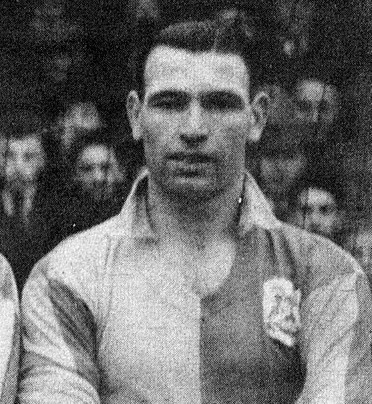 He guested once for Sheffield Wednesday in 1942-43 and 1944-45 saw him play four times for Aldershot, and he and George Milburn had a few games with Yeovil Town in 1945-46, the same season that he played eight times for Exeter City and once for Bristol City. He picked up his career with Leeds after the war, but was past his best and moved to King’s Lynn in the summer of 1948, where he became Player-Coach until the end of the 1949-50 season, when the club would only grant a one year extension to his contract, rather than the three years that he was requesting. Consequently he moved on to March Town where he stayed until he retired in 1952. He remained in Norfolk after he retired from football, becoming a PE Teacher at Smithdon High School, in Hunstanton, Norfolk. He died on 13th June 2003 at Shoulham Hall Nursing Home. near Downham Market in Norfolk. This is Ken Gadsby of Leeds United who guested 8 times for Exeter City during the war.